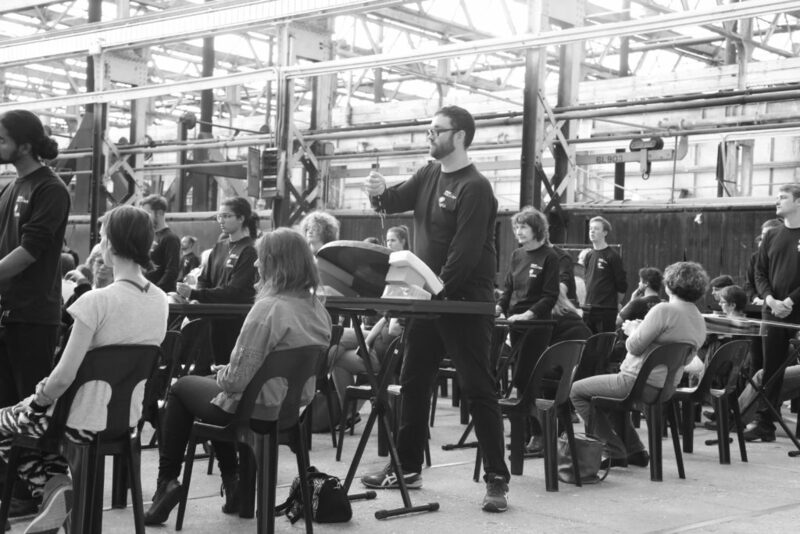 We are inviting donors and creatives to come together to help shape the future of new music and the sonic arts in Australia through our three-year philanthropic campaign. Michael Pisaro’s WA premiere of A wave and waves as part of the 13th Totally Huge New Music Festival with Speak Percussion | Image by Bohdan Warchomij. With this new campaign, Sound Connections, we are inviting donors and creatives to come together to help shape the future of new music and the sonic arts across Australia. Over this bold three-year campaign, Tura will be enabling our donors to engage in meaningful discovery. Through interaction with artists and involvement in the creative process, you will deepen your understanding of new music and the sonic arts in all their expressions by doing and experiencing. Specially curated, intimate events will provide you with fascinating insights as well as opportunities to meet like-minded people. Sound Connections features four Philanthropic Pathways: Brave New Works, Ancient Newness, The Future and At the Heart. We invite you to choose one of the four Sound Connections pathways as part of your journey with Tura. Since 1987, Tura has been commissioning, facilitating, developing, presenting, broadcasting, publishing and distributing a plethora of ambitious new music and sonic art programs. It is essential that Tura continues to support these areas of practice that push the boundaries of thinking and technology. It is the mainstay of our raison d’etre. This pathway will enable our continued support of new commissions, residencies, cross-art form collaborations, site-specific installations and performances. Donors to this pathway will be supporting the future of new music and the sonic arts in Australia. Tura’s award-winning Regional and Remote Communities Program has been running since 2003. It features powerful collaborative projects that celebrate the complexities of Aboriginal culture alongside those of new art music. We have established deep relationships with communities and individual artists. These relationships foster profoundly Australian music that is in and of the place in which it is created. Our tours, residencies and schools programs create new possibilities – for Australian music, for regional and remote communities, for artists and for audiences. Through community engagement we encourage belonging. Donors to this pathway will be supporting new regional residency programs as well as the development of new projects for touring. Providing a platform for young and emerging artists to discover their own voice and take risks, to access mentors and to be connected to the new music world globally, is a key area of Tura’s work. Young and emerging artists that Tura has supported over the last 30 years are now leaders, nationally and internationally, in the arts and cultural world. Donors to this pathway will support the expansion of Tura’s existing Young Composers’ Mentoring Program and the development of a new Youth and Education Program. At the Heart fosters and celebrates the work of Australian women, and those who identify as women, in new music and the sonic arts. Tura has a proud history of supporting the careers of women composers, sound artists and performers. They have gone on to be leaders and influencers within our Australian music and sound art landscape. Donors to this pathway will enable Tura to commission more female composers and sound artists, and for Tura to take affirmative action across all areas in supporting opportunities for women within the Australian new music and sound art world. Founded in 1987, Tura New Music has grown into the multi-award winning organisation we are today. The generosity of our donors has played a vital role in making this possible. That support fuels the grit, noise and dynamism that is integral to Tura. This campaign honours that support by facilitating meaningful connections between donors and artists. Consider making a tax-deductible donation today.